The idea for the Weasel came from the work of British inventor Geoffrey Pyke in support of his proposals to attack Axis forces and industrial installations in Norway. Pyke's plan to hamper the German atomic weapons development became Project Plough for which he proposed a fast light mechanised device that would transport small groups of commando troops of the 1st Special Service Force across snow. In active service in Europe, Weasels were used to supply frontline troops over difficult ground when wheeled vehicles were immobilised. The first 2,103 vehicles designated as T-15 and later categorized as the M-28 Cargo Carrier had 15 in (380 mm) Kégresse-style "rubber-band" style tracks, the later version designated as M-29 had 20 in (510 mm) tracks of the same format. The T-15/M-28 version had a completely different hull and a reverse drive line to the latter M-29 versions. Some of the most noticeable differences were that this early versions [T-15/M-28] had a rear engine front wheel drive system; that used the earlier track as well as the bogie wheels were of a distinctly different arrangement. The hull itself was designed slightly different with only a two-passenger capacity. The M29 was a front engine, rear wheel drive system with the changed tracks and different bogie wheel arrangement. The Hull was also changed to accommodate a larger passenger/load capacity. The M-29 was somewhat amphibious, but with a very low freeboard; the M29C Water Weasel was the more amphibious version, with buoyancy cells in the bow and stern as well as twin rudders. The M29C could not operate in other than inland waterway conditions, so its use in surf or rough water was very limited but did see action in the Pacific theatre. An easy way to distinguish the difference from an M-28 and M-29 is to look at the side track arrangement of bogie wheels. Evidence exists for M29s being brought to the Meiringen railway station in November 1946, to support the U.S. Army's attempt to rescue the twelve individuals from the scene of the 1946 C-53 Skytrooper crash on the Gauli Glacier. The Weasels were planned to be used for a ground rescue, climbing up the Gauli Glacier. A pair of Swiss Air Force Fieseler Storch STOL aircraft were able to effect the rescue solely by air, before the Weasels were needed. M29 Weasel with various slogans written on the front. M29 Weasel in Winter 1944. M29 Weasel knocked out in combat in Okinawa. M29 Weasel of First Marine Division communication section in Korean war. The Weasel idea was introduced in 1942, when the First Special Services Force needed transportation into Norway to knock out strategic power plants. The vehicle needed to move quickly and easily through the winter snows of Norway. It needed to be air transportable and be able to withstand the effects of being dropped by parachute and would also be able to carry arms, explosives and minimal resupply stocks. The Norwegian mission was cancelled and therefore the Weasel was never used for its original intention. However, as it was amphibious and could cross terrain too soft for most other vehicles, it was used widely in both Italy and on the Western Front. It went ashore on Normandy, it was with the U.S. Army during the breakthrough at St. Lo., the Battle of the Bulge and in the mud of the Roer and the Rhine. M29 was a Cargo Carrier but was also used as a command center, radio, ambulance and signal line layer. US soldiers soon realized the Weasel could be used as an ambulance, as it could get to places not even Jeeps could. Another use was for crossing minefields, as its ground pressure was often too low to set off anti-tank mines. After the war, many surplus M29s were sold to allied countries (Norway, Sweden, France, etc.). Some M29C and M29 survived to serve in Korea, supplementing 1/4 ton 4x4 cargo vehicles in rough conditions. They served in Arctic and cold weather operations until retired in 1958. Large numbers of retired Weasels were sold off in the 1950s to civilians and municipal organizations. For example, 25 Weasels were loaned for the VIII Olympic Winter Games in 1960.
in November 1944, USMC distributed M29s to the 3d, 4th, and 5th Marine Divisions. They proved invaluable with its first appearance in combat on Iwo Jima. It also saw use on Okinawa. The USMC used only the non-amphibious version, but it was capable of hauling a half-ton load through sand and mud. Besides this they pulled trailers and artillery pieces over the terrain that wheeled vehicles could not negotiate. During the First Indochina War, the 1st Foreign Cavalry Regiment was in charge of fighting Viet Minh guerrillas in the Mekong Delta area. Its units, 1st and 2nd Escadrons, received M29C Weasels from the 13th Demi-Brigade of Foreign Legion in 1947. Initially they were unsuccessful as they were crewed by inexperienced men, used wrong tactics and were deployed without infantry support. Their losses were heavy. The 1er régiment de chasseurs à cheval [fr] also deployed 1 Escadron of M29s from 1949 to 1953. French soldiers learned fast after several months of fighting, but the real deployment of full forces was possible only when they received LVT-4s and LVT(A)-4s in 1950. Now they could move stronger infantry units around. In September 1951 1er Groupement Autonome was established, consisting of two escadrons of Weasels (33 each), three escadrons of LVT-4 (11 each) and one fire support platoon of 6 LVT(A)-4. French Weasels, known as Crabes were heavily armed with Chaterrault M1924/29, Bren or Browning M1919 machine guns, 57mm M18A1 recoilless guns and even 60mm mortars. French mountain troops and French Gendarmerie used M29s until 1970. Amphibious M29 Weasels of the 79th Armoured Division were used by British commando troops in the Walcheren operation, supplementing LVT Buffalos. This Division used also non-amphibious variant of the Weasel, modified for clearing anti-personnel devices. Non-amphibious Weasels were also used by British Infantry Divisions fighting in the Saar-Moselle Triangle, as they were often the only means of getting supplies forward. After the war they were kept in service for a few years. M29 Weasel was used extensively by Canadian forces from the fall of 1944 during battles to clear the marshy Scheldt estuary, the flooded approaches to Antwerp. Later M29s supported Canadian advance through flooded areas in Netherlands and Germany. After the war, they were kept in service for use in the Arctic. The engine was a Studebaker Model 6-170 Champion, a 6-cylinder 169.6 cu in (2,779 cc) cubic inch 4-stroke engine running on 72 octane gasoline delivering 70 bhp at 3,600 rpm. Fuel capacity was 35 US gal (130 L). Under average conditions (typically 5 miles per gallon), it could range 165 mi (266 km). ^ TheGluetothetube (ed.). simvid 1 (YouTube) (in German). Neue Zürcher Zeitung. Event occurs at 6:03 to 6:06. Archived from the original (YouTube) on January 8, 2013. Retrieved April 5, 2014. 1946 C-53 Skytrooper crash on the Gauli Glacier. ^ a b Dunstan 2019, p. 16. ^ a b Dunstan 2019, p. 24. ^ Dunstan 2019, p. 33. ^ Dunstan 2019, pp. 17-18. ^ "United States' M Number Designations – World War II Vehicles – World War II Vehicles, Tanks, and Airplanes". Wwiivehicles.com. Retrieved 2010-06-29. Philip R. Kern. "The Studebaker M29 Weasel". Military Vehicles Magazine. 1, 2 & 3. "Studebaker M29 Weasel". ISO Military Vehicle Series. 1985. Richard Quinn. "Studebaker Goes To War". Turning Wheels. Bart Vanderveen (1989). Historic Military Vehicles Directory. U.S. Army Transportation Museum. "M-29 weasel". Archived from the original on 2008-02-28. Retrieved 2007-12-29. "Oldtimer gallery. Trucks. Studebaker M29 (UST24) 'Weasel'". Autogallery.org.ru. Retrieved 2010-06-29. 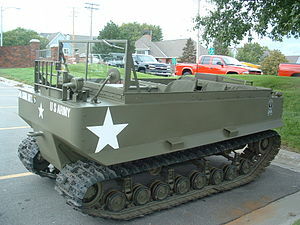 "M-28 / M-29 Weasel Amphibious Vehicle". Olive-drab.com. Retrieved 2010-06-29. Dunstan, Simon (21 February 2019). French Armour in Vietnam 1945–54. New Vanguard 267. Osprey Publishing. ISBN 9781472831828. Wikimedia Commons has media related to M29 Weasel. ‹See Tfd›US patent 2420133, ‹See Tfd›E. J. Hardig, "Track for track-laying vehicles"